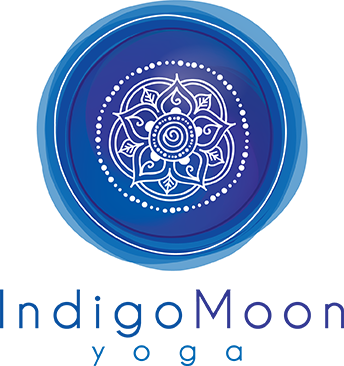 Welcome to Indigo Moon Yoga! The path of yoga is as varied as the many people practicing. We delight in our physical practice, observing the many physical changes that occur on our mat. The investigation of our ever changing breath gives us new insight to the connection of our outer existence to our inner life. We ponder ancient texts and how knowledge from the ancients as relevance to our modern, complicated lives. The Yoga Sūtras of Patañjali are a collection of 196 Indian sutras (aphorisms) on the theory and practice of yoga. The Yoga Sutras were compiled prior to 400 CE by Sage Patanjali who synthesized and organized knowledge about yoga from older traditions. The Yoga Sūtras of Patañjali was one of the most widely translated ancient texts and saw a modern revival in the 20th century. MAITRI KARUNA MUDITOPEKSANAM SUKHA DUHKHA PUNYAPUNYA VISAYANAM BHAVANATAS CITTA PRASADANAM. In the Yoga Sutra Patanjali lays out a circuitous route for attaining the goal of yoga. If the goal of yoga as Patanjali puts it is, “to calm the fluctuations of the mind” how do we go about it? We can practice on our mat, learning our technique, watching our breath, stilling our mind. Often we take this feeling with us, the sense of calm and inner peace, it spills over into our day. It’s what keeps us coming back time and again to our mat. How do we maintain this sense of inner peace and calm off of our mat through the chaos of our daily lives? We are often met with difficulty in our interactions with others. Patanjali gives us guidance to take off our mat in our daily interactions with others. The four virtues Sukha, dukha, punya, apunya – the happy, sorrowful, the virtuous, the non-virtuous, can be applied to the people in our lives. We can apply four attitudes in how we react and interact with the people in our lives. Maitri, karuna, mudita, upekshanam – friendliness, compassion, cheerfulness and indifference. Is it possible to delight in the happiness of the coworker who received the promotion and we did not. Can we transform our underlying discomfort at the success of others when we continue to live in disappointment. Can we show compassion for the pain and disappointment experienced by those in our lives when we find good fortune and even in our own moments of suffering. When we are able to find joy in the virtuous, acceptance or detachment for those we find non-virtuous there remains a still point, a place of calm abiding. By practicing these attitudes in the face of difficulty, and the challenges of our interactions, the mind becomes serene and clear. We find our true nature, quiet and still, like the surface of a pond. Knowing that below the surface something may come bubbling up or a pebble is tossed, disturbing the stillness. When we are disturbed we resume our practice calming the ripples on the surface, seeking equanimity. Yoga gives us many tools, not limited to our physical practice on the mat. It is in the difficult moments when we are reminded of the true nature of our practice.